In May, Teena and her sister, Sarah, spent a week's vacation in Jamaica. She returned home with a two cans of Red Stripe Lager from Jamaica and two cans of Carib Lager from Carib Brewery in Trinidad and Tobago. Sir Gerald Wight, who flew with the Royal Air Force during the First World War, founded the Caribbean Development Company Limited in 1949. The idea of the company was to make the country less dependent on the sugar and oil industries, which were the two major industries that supported the economy. The company developed a brewery and a glass/bottle works, which became separate companies later on. The big moment for the new brewery Carib was on May 16, 1950, when it brewed its first bottle of Carib lager. 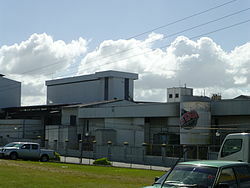 Carib Brewery started with seven employees and today has over seven hundred. It is the largest non-energy manufacturer in the country and brews over two million cases of Carib every year. The Caribbean is extremely hot, so lighter lagers are more appreciated than European style lagers that have a hop bite to them or English ales. The founders know this as well as today's brewers who brew this beer. Carib pours a very light yellow/straw colour with a white head. As you can see by the picture it is very clear and easy to see through. This beer is a very light tasting beer, despite being 5.2% apv. There is no hop bite in this but that's not what most people want while sitting on the beach on a hot afternoon. Instead this beer offers a light, slightly sweet taste that is quite refreshing. Thanks, Teena! I get a taste of Trinidad and Tobago while sitting in Toronto enjoying the Toronto Honda Indy.